In an era of minimalist sets (often no more than a few chairs and props) Letters From the Front utilizes a richly and authentically detailed, stage-filling set designed to expand or contract to accommodate a wide variety of venues. The set is just one element of a fully equipped production. Everything is included except the walls and seats. The lighting system is state-of-the-art with over 40 luminaries, digital dimmers and control board, electrical distribution unit, voltage and Hz convertors (for overseas shows), lift stands, trusses, cables, and rigging equipment. A closer look at the set showing how rear-screen images are used to enhance certain segments of the show. 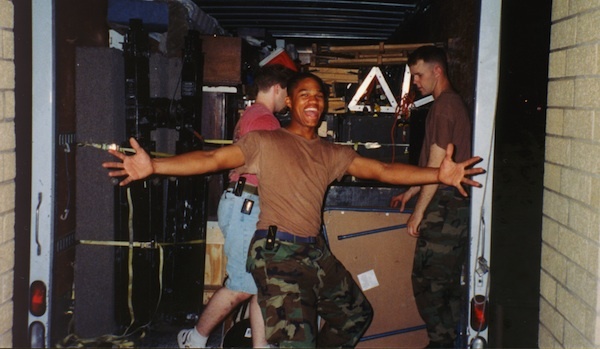 This was during a performance at the Pentagon, the only professional theatrical touring company that has played there. The center focus of the set is a large picture window. During most of the show the view out the window can be seen. But during certain segments, especially when letters are being read, photos and artwork replace the window. This is accomplished by a powerful backstage video projector. During the play, hundreds of computer controlled images are fed to the projector. Katharine (Della Cole) and Johnny (Bob Curran) break into a spontaneous jitterbug. Music and sound effects are an integral part of Letters From the Front. An original score was commissioned, written and recorded exclusively for the show, accented with popular WWII era big-band songs. The same computer program that controls the video images also controls the music and sound effects, synchronizing them with the action on the stage and playing it all back though a system of amplifiers, loud speakers, and monitors. This is operated by a control center located at the rear of the auditorium. 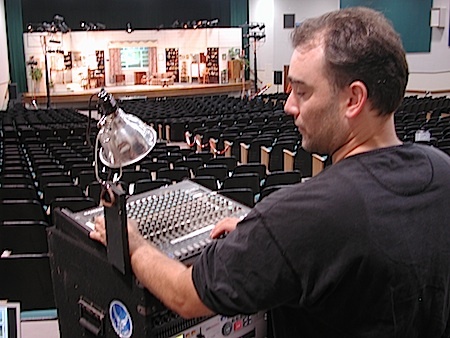 Prior to a performance, the Technical Director checks lights and sound. One of many costume tests for Katharine (Della Cole). In an effort to completely immerse audiences in the WWII home front, particular attention is given to costumes, set decorations, and props — in all over a thousand items. The costumes are hand-made from actual WWII-era patterns, then altered to fit the actors. Flea markets as well as retro and antique stores are combed for accessories, including jewelry, shoes, and hats. The same attention is given to furniture, lamps, and myriad other items that might be found in a typical American home in 1945. Why go to all this trouble? To us the answer is obvious. Our primary audience is the men and women who serve in America’s Armed Forces. Every day, at home and abroad, they give nothing less than their maximum effort to protect our country and its freedoms. We honor them by giving our maximum effort. Letters From the Front is a completely self-contained professional touring show. We bring everything including the truck to bring it in. For this reason, our show will play in virtually any venue, a claim few other professional touring shows can make. Although we provide cast, management, and crew, we do request a small work detail to help us during load in and out. Theater experience is not necessary.